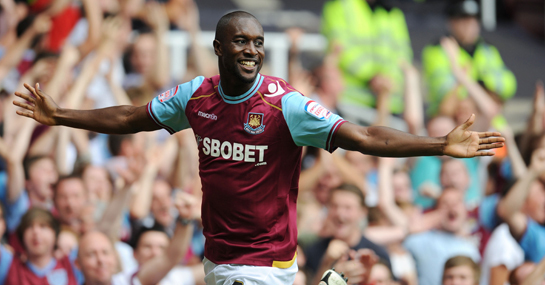 West Ham United have been offered a bid in the region €5m for the services of Carlton Cole by Turkish club Galatasaray. As the Turkish transfer window doesn’t shut until 10pm on Monday, Galatasaray are well within their rights to make approaches for players and Carlton Cole, it seems, is top of their wishlist. Having done some excellent work on the final day of the British transfer window by bringing in Henri Lansbury, David Bentley and Guy Demel, Sam Allardyce will be hoping he can hold on to striker Cole as he looks to take West Ham back up to the Premier League. Having already turned down a move to Premier League club Stoke City, there are no guarantees that Cole will want to make the move to Turkey but it seems the Turkish side are likely to be given a chance to talk to him. Cole has already netted three times this season and is clearly Allardyce’s preferred striker, but West Ham have signed three strikers in this window in John Carew, Sam Baldock and Brian Montenegro. Couple those three with Frederique Piquionne and Freddie Sears and West Ham have a very strong strike force that the board would believe could cope with the loss of Cole. West Ham are currently 2/1 to win the Championship and Cole has scored a third of West Ham’s nine goals this season suggesting he could be a major factor in any promotion bid. Cole has already shot to the top of the top Championship goalscorer betting market and both he and Kevin Phillips can be backed at 8/1 to win the golden boot. Losing such a player would obviously have a major impact on West Ham’s season and while the likes of Carew, Piquionne and Sears should all thrive in the Championship, Cole is already doing so. Allardyce will not want to change a winning formula but the West Ham board are likely to accept the bid so it seems it’s a case of whether Cole wants to go an live in Turkey.